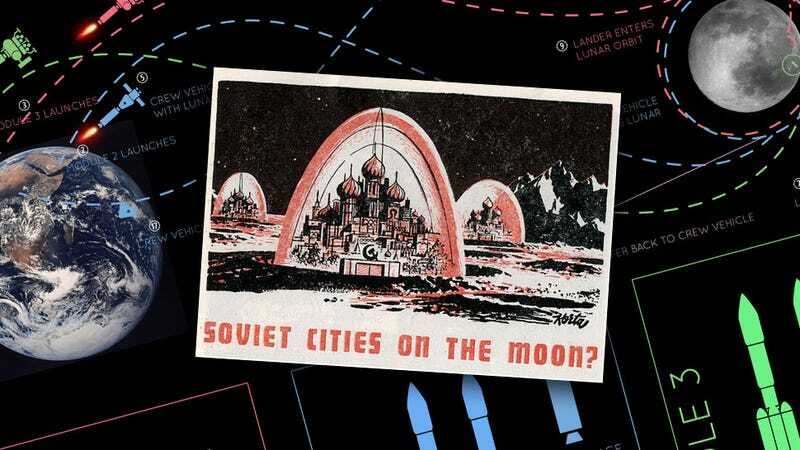 Decades and decades after they pretended never to be in a “moon race” with the U.S., Russia reportedly plans to land cosmonauts on the moon by the 2030s, according to the news agency TASS. The most recent plans call for up to six launches of the Angara A5V heavy-lift rocket to put enough hardware into orbit for their first mission, which appears to involve establishing a lunar base. A lunar base, for real. Long the stuff of science fiction, it seems Russia is trying to do this for real, or at least wants to. The BBC reported in October that the Russian and European space agencies are preparing to go to the moon with an eventual settlement in mind. The most obvious difference between the plans for Russia’s first manned lunar mission and the American one 46 years ago is in the number of launches. The U.S. did it with one massive Saturn V launch, so why are the Russians planning a mission that requires so many launches? Part of the reason is that the Saturn V had about four times the lifting capacity of the Angara rockets, but that’s not the full story. Back when the Russians wore more red and called themselves the ‘Soviets.’ they also tried the single, massive launcher approach to a moon landing: the failed N1 rocket. It’s not that I don’t think the Russians couldn’t build a working, massive launch vehicle, I just think they realized for them it doesn’t make sense. The Angara rocket will eventually replace the Russian workhorse heavy-lift rocket, Proton. It makes more sense to develop a launch vehicle that has commercial and other uses as well, as opposed to building a massive super-heavy lift vehicle. The US only used the Saturn V for the seven moon landing launches (only six made it; if you’ve seen Apollo 13, you know the story), the lunar-and-earth orbiting manned and unmaned Apollo test missions, and then once again to launch Skylab, America’s first space station. The Saturn V was a tremendous achievement, but it wasn’t exactly a useful multi-purpose launch vehicle, and I think the Russians want the Angara to get them to the moon and make some money launching satellites. According to the source, a manned flight to the moon is possible under a scheme envisaging two coupled launches. First, a lunar take-off and landing complex is placed on a low Earth orbit, and then the upper stage with effective cryogenic propellants is orbited. The third launch orbits a manned spacecraft, and the fourth - another upper stage. After docking of the lunar take-off and landing complex with the manned spacecraft on the lunar orbit, the crew descends to the Moon surface inside the lunar take-off and landing complex, carries out the research program and returns to orbit. After that the spaceship returns to Earth. Also, another coupled Angara-A5V launch will be needed before the manned flight to deliver and deploy the first expeditionary unit of the lunar base on the Moon. A few things to note: manned orbiter/command/return spacecraft shown is not a Soyuz derivative, but rather Russia’s Advanced Crew Transportation System (ACTS), a two-module, truncated-cone capsule system that looks and awful lot like the US’s Orion. This is one of the many Soyuz-successors that’s been planned for a long time, sometimes with ESA involvement, sometimes not. I think it’s possible that this component could be replaced with a cheaper Soyuz-derived solution if this mission actually happens. Also, there’s no information yet about just what the “lunar base” might turn out to be. It can’t be too large at this early stage, since it’s just one module that’s being launched the same way as everything else, meaning it’ll have to be similar in size and weight to the lander or ACTS. My guess is we’ll see a single-cylinder module, something like a lander but replacing the launch engine with more robust life support systems. It’ll be a small base to start with, but I suspect it will be modular, and subsequent launches would add modules to it, just like how we build space stations, but sitting on the lunar surface. The continuation of the Luna program could be the beginning of Russian plans to establish a lunar base sometime in the 2030s. The proposed base would include a solar power station, telecommunication station, technological station, scientific station, long-range research rover, landing and launch area, and an orbiting satellite. Even if it’s modest at first, a permanent lunar base is exactly what would be needed to make this mission relevant, so many decades after people first walked on the moon. New manufacturing methods, including 3D printing, have been developed that can make the use of lunar regolith as a building material possible, and the promise of eventual mining of Helium-3 as a fuel for hoped-for fusion reactors are finally giving lunar bases enough justification to exist. It’s an ambitious idea, and I think it’s at least technically possible. Russia has had many advanced programs proposed in the past decade or so (like, say, the Kliper spaceplane) that eventually came to nothing due more to economic issues than anything else, so I’m not convinced yet any of this actually will happen. Still, I hope it does, and maybe the threat that the Russians will steal the lunar rover and sell it on eBay.ru will be enough to get our American asses back in gear and get a lunar base of our own.